Israel's ambassador to the United States was quoted recently as saying that US-Israel relations were in a "crisis of historic proportions" over the Israeli announcement that it planned to construct 1,600 new apartments in Jerusalem. The news media says that the announcement was made during a visit by Joe Biden and that embarrassed the administration. Secretary of State Hillary Clinton called the move "an insult." But why? When one knows the whole story, it becomes evident that this is nothing more than a tempest in a teapot. The facts are a lot more innocuous than those presented by the Obama administration and the Obama media. To listen to them, Prime Minister Netanyahu timed the announcement to coincide with the Biden visit as a deliberate effort to stick his thumb in the adminisration's eye. Netanyahu didn't know, or he would certainly have quashed the announcement. The last thing Netanyahu wants or Israel needs is to antagonize the United States - especially under the current circumstances. Israel needs every friend it can get. What the Obama administration found so insulting was that a minor Israeli bureaucrat announced that the government had approved the fourth out of seven stages necessary for the construction project - not slated to begin until at least 2013 - and then only if it clears the remaining three bureaucratic hurdles. The construction is taking place in Ramat Shlomo, a Jewish neighborhood that both sides have already agreed will stay part of Israel in any future proposed division of the city. Even the Palestinian Authority was ok with it - until Washington made an issue of it. It is as if the administration was looking for an excuse to distance itself from Israel, no matter how weak. And believe me, this is weak. Most Israelis believe that Obama is acting, not as a broker, but as an agent for the Palestinians. Benny Morris writes in a UK Telegraph op-ed entitled, "America and Israel: The End of a Special Relationship?" Did the Obama administration embark on its confrontation with Netanyahu in order to force him to switch coalition partners from the two main Right-wing parties –Yisrael Beiteinu and Shas – to the more agreeable centrist Kadima Party? Or is it merely seeking to freeze the Israeli settlement enterprise, to pave the way for Palestinian re-entry into peace negotiations? The Obama administration has begun using the term "Palestinian East Jerusalem" and its demand that Israel freeze all new construction in the city concedes for the first time to the Palestinian demand that parts of Jerusalem now part of Israel will become part of the new 'state of Palestine'. Why would the White House be more outraged at an Israeli plan to build apartment buildings in Jerusalem than it is over the Iranian plan to build nuclear weapons? We should have paid more attention to Jeremiah Wright. 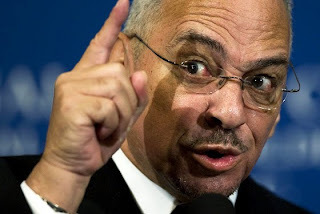 Jeremiah Wright was Barack Obama's pastor for twenty years. Obama credits Wright with "leading him to Christianity." He officiated at the Obamas' marriage; he baptized Obama's kids. Obama explained away the 9/11 sermon by saying he wasn't there that Sunday, and anyway, "It just sounds like he was trying to be provocative." "I don't think my church is actually particularly controversial. [Reverend Wright] is like an old uncle who says things I don't always agree with." Obama even praised Wright's ministry outlook, referring to his "social gospel" and his focus on Africa, "and I agree with him on that." "Sen. Obama has said repeatedly that personal attacks such as this have no place in this campaign or our politics, whether they're offered from a platform at a rally or the pulpit of a church. Sen. Obama does not think of the pastor of his church in political terms. Like a member of his family, there are things he says with which Sen. Obama deeply disagrees. But now that he is retired, that doesn't detract from Sen. Obama's affection for Rev. Wright or his appreciation for the good works he has done." But as more was learned about Reverend Wright's 'good works' - his association with the Nation of Islam, his openly-expressed hatred for white America, his denunciations of Israel and his solidarity with the Palestinians, Obama decided to speak out for himself. In a scene reminiscent of Casablanca's Inspector Renault expressing shock that "there was gambling going on here" as he pocketed his winnings, Obama expressed 'shock' at Wright's comments and denied he'd ever heard him make any of them. “The statements that Rev. Wright made that are the cause of this controversy were not statements I personally heard him preach while I sat in the pews of Trinity or heard him utter in private conversation." The mainstream media, clearly terrified at the prospect of being labeled racist, accepted Obama's denial without reservation. Very few even entertained the possibility that Obama's worldview may have been colored by the sermons delivered by his pastor. Incredibly, some even scoffed at the idea, probably because not having any experience with churches, are unaware of why people choose particular church homes in the first place. It is because they share the worldview expressed by the pastor teaching from the pulpit. When someone profoundly disagrees with a pastor's preaching or a church's worldview, he looks around for a new church. Obama defended his pastor - the way that you or I would defend our own. Until the Wright Affair became a political liability. Then he fired Wright from his campaign, claiming he was 'profoundly disturbed' by the comments that by that point had been heard by everybody in America except Barak Obama. "Reverend Wright was on the verge of retirement, and because of my strong links to the Trinity faith community." So he didn't really like his 'old uncle' Reverend Wright, but he just loved his church, and so he stayed because Wright was 'on the verge of retirement' - for twenty years? Eventually, the Jeremiah Wright Affair died down after the media started accusing Wright's critics of 'racism' or being 'Islamophobic' and so on and so forth. By Election Day, everybody had forgotten all about Reverend Jeremiah Wright and Barack Obama was elected President of the United States. Elections have consequences. And Jeremiah Wright mattered.